Ford Motor Company (NYSE: F) kicks off its popular Drive One 4 UR School program today and enters 2011 with more than $5 million in funds donated to high schools nationwide since the program's inception in 2007. 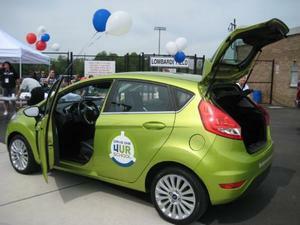 The program is Ford's most successful test-drive initiative ever executed. Since the start of the program, more than 255,000 test-drives at more than 1,500 events in 49 states have been hosted by Ford and its dealers around the country. The program gives participants the chance to experience Ford's new fuel-efficient lineup of vehicles, as well as leading safety and technology features. Ford offers 12 vehicles that lead their sales segments in fuel economy, including four vehicles with EPA certified 40 mpg or higher fuel economy ratings -- a claim no other full-line automaker can match. "With oil nearing $100 per barrel and gasoline prices continuing to rise, consumers' consideration for fuel economy once again is taking top billing," said Ken Czubay, Ford vice president, U.S. Marketing, Sales and Service. "We have a great opportunity to showcase our fuel-efficient lineup at this year's Drive One 4 UR School events, while at the same time helping schools raise money for valuable programs and activities that might otherwise be eliminated." Ford developed the Drive One 4 UR School program to connect dealers with local community efforts in raising up to $6,000 for high schools in a single day test-drive event. As schools continue to cut back on funding for facility improvements and extra-curricular activities, the program remains a strong fund-raising source to help schools fund valuable programs. "This has got to be the best program on the planet," said Frank Bonuchi, general manager, Auffenberg Ford in O'Fallon, Illinois. "I have been in dealership management for over 30 years and I have never seen a program that successfully promotes all the great things going on at Ford and the dealership, while also giving our communities around the country a much needed helping hand." 2011 Ford Fiesta - The all-new Ford Fiesta offers an expressive, vibrant design, sharp reflexes and 15 key features and technologies like SYNC®, giving it the safety, convenience and connectivity previously unseen in the small car segment. With a responsive 1.6-liter I-4 engine, advanced PowerShift six-speed automatic transmission and electric power-assisted steering (EPAS), Fiesta delivers a best-in-class 40 mpg on the highway. 2012 Ford Focus - The all-new Focus is the most significant global nameplate and delivers smart features, spirited performance and 40 mpg fuel economy packaged in modern, European-inspired design finishes. The all-new Focus Titanium model promises to appeal to drivers shifting from larger, premium vehicles looking for sporty handling; while the high-performance Focus ST with turbocharged, direct-injected EcoBoost power will get enthusiasts' hearts racing. 2011 Ford Explorer - The 2010 North American Truck of the Year is completely reinvented and combines exceptional handling and towing capability with sleek lines and class-leading fuel economy. The all-new Ford Explorer also offers a suite of connectivity and safety features, including MyFord Touch, terrain management system, and the world's first rear inflatable seatbelt. 2011 Ford Edge - With newly-redesigned exteriors, improved interior craftsmanship, and class-exclusive MyFord Touch driver connect technology, the dramatically refreshed 2011 Ford Edge and Edge Sport offer a unique crossover experience. Ford's advanced engine valvetrain technology - Ti-VCT (twin independent variable camshaft timing) - helps Edge V6 achieve best-in-class power and torque with unbeatable fuel economy of 19 mpg city and 27 mpg highway. 2011 Ford F-150 - With four powertrains -- the most extensive powertrain makeover in its 62-year history, and the first EcoBoost truck engine, the 2011 Ford F-150 delivers best-in-class power and up to 20 percent better fuel economy. Available with SYNC® and Ford Work Solutions connective technology and class-exclusive features like electric power-assisted steering (EPAS), the 2011 Ford F-150 offers more choice and capability than ever. "With all the cutbacks in school programs, Ford is to be congratulated for this," said Ed Avansino, a test drive participant at a 2010 event conducted at Carson High School in Carson, City, Nevada. The 2011 Drive One 4 UR School program kicks off its spring tour in March and runs through June. The program starts up again in the fall, with events taking place from August through November. Ford Motor Company, a global automotive industry leader based in Dearborn, Mich., manufactures or distributes automobiles across six continents. With about 164,000 employees and about 70 plants worldwide, the company's automotive brands include Ford and Lincoln. The company provides financial services through Ford Motor Credit Company. For more information regarding Ford's products, please visit www.ford.com. NOTE TO EDITORS: For news releases, related materials and high-resolution photos and video, visit www.media.ford.com. Follow at www.facebook.com/ford, www.twitter.com/ford or www.youtube.com/fordvideo1.